﻿ Riad Assalam Marrakech. JIMAT di Agoda.com! Menawarkan penginapan yang berkualiti tinggi di daerah budaya, beli-belah, siar-siar di Marrakech, Riad Assalam merupakan pilihan popular untuk kedua-dua tujuan perniagaan dan percutian. Dari sini, tetamu boleh menikmati akses mudah kepada semua yang bandar meriah ini boleh tawarkan. Pelawat yang datang ke hotel boleh melawat tarikan utama di bandar ini seperti: Istana Badi, Minbar Koutoubia, synagogue. Riad Assalam menawarkan perkhidmatan yang sempurna dan semua kemudahan penting untuk menceriakan pelancong. Hotel ini menawarkan pelbagai kemudahan di lokasi untuk memuaskan hati tetamu termasuk yang arif. Hotel-hotel telah direka demi keselesaan dan memudahkan tetamu. Sebahagian bilik menyediakan akses internet (wayarles), internet tanpa wayar (percuma), tab mandi pusaran air, bilik tidak merokok, pendingin hawa. Hotel ini menyediakan kemudahan rekreasi yang baik seperti tab panas, sauna, padang golf (dalam jarak 3 km) , kolam renang dalam, spa untuk membuat penginapan anda benar-benar tidak dapat dilupakan. Nikmati perkhidmatan yang sukar ditandingi dan lokasi benar-benar berprestij di Riad Assalam. Staff were very friendly and helpful. U feel like home when u r back to the Riad. Within 15 min walking distance, u can reach....I say two thirds of the major attractions in town. First night we had the lemon chicken tajine there. It’s the best we had in our 2 weeks Maroc trip. It was quaint and clean and the staff were friendly. Location is excellent, a few minutes walk from the main square. I would not recommend this riad to anyone who is older and/or has mobility problems. There is no lift, there are 3 floors with only one staircase, which is very steep. No TV, and no phones in the rooms so if you need anything you have to traipse all the way down and go find someone to help you. Very few staff, as far as I could see there were only 2 people around at any given time. We paid extra for a deluxe room but it wasn't deluxe by any stretch of imagination. Small for what we paid, and surely not able to accommodate a 3rd. However, the hotel gave us another room for the 3rd member of our group at no extra cost, which was nice of them. Breakfast was good. this riad wasn't very easy to find but we were able to locate it by a local's help because the taxi driver didn't know exactly where it was located.of course we had o give dirhams to the young man who showed us. it was located near a market and street but amazingly,once inside, it's so quiet. 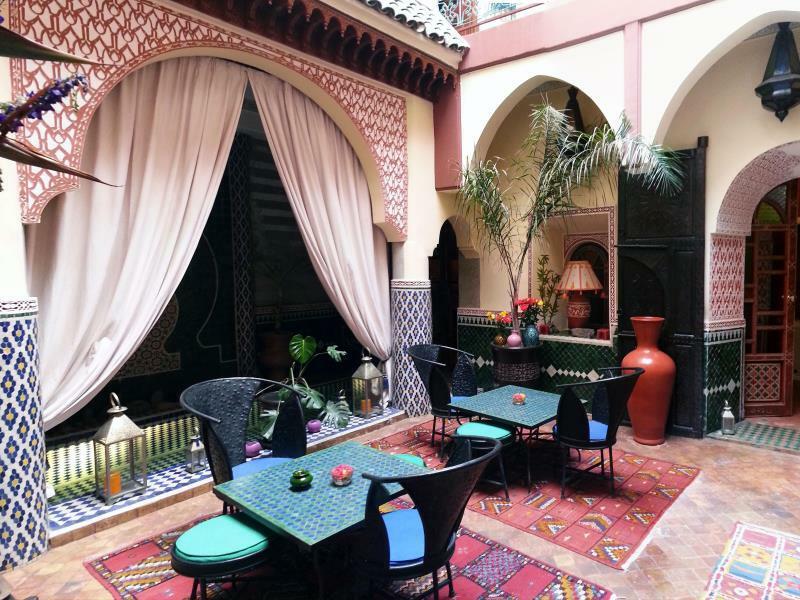 we enjoyed this Riad as it was close to the markets and palace. Staff were exceptionally helpful; strongly recommend! Das Inhaberehepaar hat sich herzlich um uns gekümmert, der Aufenthalt in diesem schönen Riad war genial. Die Lage in der Medina ist spitze und dennoch ruhig. Kann dieses Hotel nur weiterempfehlen. Fue bastante complicado encontrarlo ya que llegamos de noche y se encuentra metido en unos callejones. Una vez instalados el Riad es muy bonito, cómodo y el personal es muy atento y servicial. Tiene una terraza que con el buen tiempo es un lujo. habitación grande y limpia. trato excelente. muy céntrico. riad a 10 minutos de la plaza de jamaa el fna con habitaciones grandes y limpias. todas las comodidades. trato excelente por parte de los dueños y del staff. desayunos completos y variados. wifi gratuito. las terrazas superiores son un espacio fenomenal para descansar del bullicio de la ciudad. Ha sido una estancia agradable. He estado amablemente atendido por todo el personal de servicio. Las habitaciones son muy espaciosas y limpias. Es un lugar con una restauración que conserva muy el estilo marroqui.